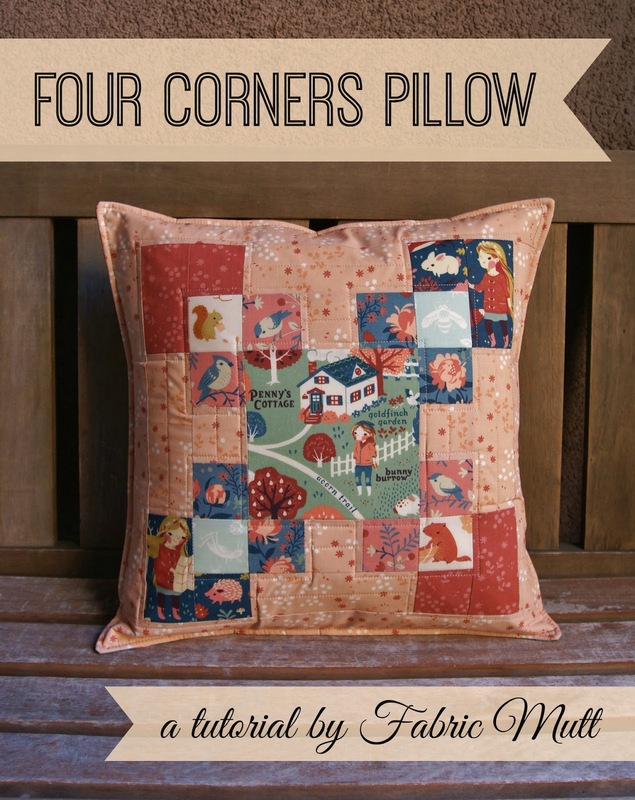 Today we're excited to share this exclusive 'Four Corners Pillow' tutorial from Heidi of The Fabric Mutt! She shows us how to really show off the prints in Acorn Trail by fussy cutting the adorable little creatures. Check it out! Acorn Trail by Teagan White is one of my favorite new fall collections. Showcasing adorable critters, beautifully saturated colors, and just a touch of vintage style, these prints feel right at home in my house. My friends at Birch Fabrics were kind enough to send me a bundle of this fabric, and I thoroughly enjoyed coming up with a new tutorial for it: the Four Corners Pillow. Every pillow needs a buddy, and I couldn't resist using leftover fabric squares to make an extra pillow featuring a traditional Around the World quilt block. Both of these pillows are quilted in soft peach Aurifil thread. I absolutely love the way they look together! The backing of the main pillow features one of my favorite prints in the collection: Peonies in Blue. This fabric has such a great retro vibe, and the colors are gorgeous. The Four Corners Pillow is a perfect weekend project. These blocks come together very quickly, and it's a great opportunity to play with color. In the directions below, I've given you the exact prints I used from the collection to help you get the same color blending that I have in the original. Enjoy! 1. Make the side blocks. Sew together in a row one 2 1/2" square of Birds & Branches, one 2 1/2" square of Tonal Floral in Shell, and one 2 1/2" square of Peonies in Blue, paying careful attention to the photos in this step to see where the squares will lie, especially if you're using a directional fabric. Sew a 2 1/2 x 6 1/2" rectangle to the outer edge of each side block, again referring to the photo above. Place the blocks around the center square of Acorn Trail Map. 2. Make the corner blocks, referring to the photo above as you sew two 2 1/2" squares together and then sew a 2 1/2 x 4 1/2" rectangle to the left or right side. Again, you'll need to be careful with your placement if you're using a directional fabric. Place these blocks in the corners between the side blocks. 3. Sew the blocks together in rows. Then sew the rows together to form the center of the pillow top. 4. Sew the 2 1/2 x 14 1/2 strips of Tonal Floral in Shell to the sides of the quilt top. Then sew the 2 1/2 x 19" strips of Tonal Floral in Shell to the top and bottom of the quilt top (if necessary, you can piece together fabric to make your strips as I had to do with my top and bottom rows), trimming any excess off the sides to make a perfect square. 5. Make a quilt stack in this order from bottom to top: 20" square of muslin, 20" square of quilt batting, and pillow top (right side up). Baste the stack together with adhesive basting spray and then quilt as desired. Trim any excess batting and quilt backing fabric from the sides of the quilt top when you finish quilting. 6. Take one of the two pieces of 13 x 18 1/2" backing fabric. Along one of the 18 1/2" sides, fold the fabric under twice about 1/3 - 1/2". Sew 1/4" from the fold. Repeat with the other backing piece. 7. Make a stack from bottom to top: pillow top (right side up), one piece of backing fabric (right side down) lined up along the top edge of the pillow with the hemmed side pointed toward the lower edge, the other piece of backing fabric (right side down) lined up along the lower edge of the pillow with the hemmed side pointed toward the top edge. Use pins or clips all along the outside edge of the pillow to hold these three pieces together and sew 1/4" from that outer edge all the way around. Clip the corners, turn the pillow right side out, press, and then sew 1/4" from the outer edge of the pillow all the way around to finish it. If you make a pillow of your own, please share it with us on Instagram! Tag it #fourcornerspillow and be sure to tag us @fabricmutt and @fabricworm. Get a head start on your fall decorating and make one this week! Thank you Heidi, for sharing this beautiful tutorial with us! Have a lovely weekend Fabricworms! And don't forget that Acorn Trail comes in quilt-weight poplin, canvas, knit, and voile too! Oh my god! This is just wonderful, I think I'm in love with this four corner pillow. A nice color scheme and such a beautiful fabric you chosen. I would like to have this pattern pillow. Thanks! Thanks for the pillow tutorial. I love the fussy cuts you did. Those fussy cuts are absolutely adorable! Another beautiful project with a clear tutorial. Thanks Heidi! That is the way I always do the backs on my pillows as well. Great design on front. patchwork blankets are made by sewing together little bits of material in geometric outlines. The charming fringes generally in differentiating shades add dynamic quality to the exhibit. I find a very good website for the best best pillow for side sleeper with neck and back pain. you can visit this site.